The news from here is that my work is changing, moving from the personal and the politically topical to the perhaps more deeply political, satirical, even moral. But that sounds very foolish. I do not know whether the poems, which are a departure for me, are at all what I hope for them. 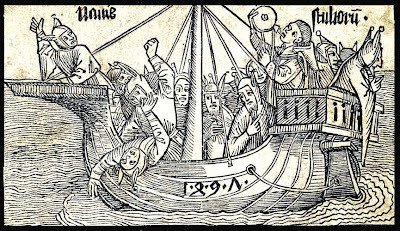 They are based very loosely, merely inspired by, the woodcuts by Durer and a couple of other artists for Sebastian Brant's Stultifera Navis, or Ship of Fools, a medieval satire first published in 1494. In any case, these poems are very different from the work in Without Paradise or Gold Star Road. Comments are more than welcome. Laugh at the world’s follies, you will regret it; weep over them, you will also regret that. no slow sad mamas wailing moan roll over. enroute. You would think we had some idea. inside out. By morning we want to be glad and are. Old buoys ding and dong us in. Gulls laugh. All passengers on deck. Prepare the dinghies. Hold your horses, people. Everybody gets there. we were modified and sentenced. Period. We had the right to remain silenced. we were finished and felt relieved. We liked what we believed we saw. Licking our sordid fortunes we were sent. Portions of the future have been pre-recorded. for horseshit and the little birds that peck there. Speeches. Nobody can recall last week! nor is dancing. Children must be corrected. and tries to tear itself away. Ka-boom! First of the fireworks and it isn’t even dark yet. for purse or pocket, not for tears but for the stench. are likely only gulls protesting this our voyage. louder, louder, everybody! That’s much better. oriental carpet, globe, and lifelike sleeping dog. to live but turned, instead, his whole life into words. our parents’ minds) we had, already, forgotten. filthier silence, wired, a lyric bomb, and sing. It wasn’t magic. Even our amnesia was strategic. someone’s bound to wear, it may as well be me. I want to bring your attention to a forgotten poet of the Left, Lola Ridge, and to the fine book that made me aware of her work. Light in Hand: Selected Early Poems of Lola Ridge edited by Daniel Tobin. I have posted Tobin's fine introduction, which places Ridge in the literary and political context of her time, with permission of the publisher Quale Press. Born Rose Emily Ridge in Dublin on December 12, 1873, the woman who would reinvent herself to become perhaps the most impassioned and certainly the most authentic of the proletarian poets of the New York modernist avant-garde emigrated with her mother as a child to New Zealand where she would marry the manager of a gold mine at the age of twenty-one. To look ahead thirty years from the life she had chosen in 1895 is to gain some measure of insight into the transformation she had undergone. 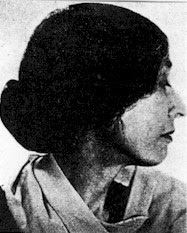 In 1927, Alfred Kreymborg—one of the leading avant-garde poets of the day— describes her as “the frailest of humans physically and the poorest financially,” though nevertheless, as Peter Quatermain remarks, she was a “woman on the spiritual barricade fighting with her pen against tyranny.”1 Indeed, after her marriage to Peter Webster failed and her mother died, Lola Ridge emigrated to the United States in 1907, staying for a brief time in California, then settling in Manhattan’s Greenwich Village. So began her life as one of the multitudes of left-wing reformers and artists (among them Kay Boyle, John Dos Passos, Harold Loeb, and Emma Goldman) who moved to lower Manhattan and contributed to its hot-bed of activism. Indeed, throughout the nineteenth century lower Manhattan had filled with poor immigrants and workers supportive of leftist causes. As an activist of revolutionary fervor, over the next three decades until her death in Brooklyn in 1941, Ridge nevertheless composed some of the most vivid and politically conscious poems of her day. At the same time, her presence among New York’s avant-garde places her work within the context of such luminaries of modernist American poetry as Marianne Moore, William Carlos Williams, and Hart Crane. The peripatetic literary and cultural sojourns of “The Lost Generation,” to which Ridge also had strong if contentious ties, also provide an evocative counterpoint to both the literary and civic life she herself decided to lead, as do the right-wing modernist programs of expatriate mandarins Ezra Pound and T. S. Eliot, and the pure poetries of the Dadaists. From this perspective, Ridge appears to be a notable lone figure standing amidst the crowd of our American literary history, at once recognizable in the aesthetic and wider cultural currents of her time, but nevertheless curiously otherwise—a vivid original whose life and work embody the tumultuous confluence of forces that shaped the twentieth century. Clearly, for the young Kay Boyle, Lola Ridge had become the embodiment of a specifically Irish dedication to a rebellion against injustice that was at once spiritual and worldly, as well as a mother figure at once associated with her own mother and with the Virgin.11 Still more significantly, as the daughter of Irish immigrants Boyle envisions the spiritually fueled “rebellion of the flesh against authority” as an ideal to put into practice in the New World, a legacy to be carried over from “another country’s history.” Ridge surely envisioned her connection to this tradition along similar lines, though at the same time the uniquely American context displayed in the majority of her poems reveals the forward-looking direction of her work. Her imagination is not merely Celtic, as Horace Gregory would have it, but emigrant in its character. One need only read her long poem, “The Ghetto,” a sustained portrait of life in the Jewish-American ghetto where she lived, or the ironic “Lullaby” in which an African American baby is thrown into a burning house by a white woman, to recognize that Ridge harbors no nostalgia either for “Inisfail” or “The Land Paved With Gold.” Indeed, her implicit affirmation of an Irish American poetic consciousness in poems like “Crucible,” written in praise of Robinson Jeffers, as well as in her affiliation and support of such younger poets as Horace Gregory and especially Kay Boyle, bears witness to her desire to forge both a life and a body of work at once resonant with Irish traditions though nonetheless cast in the American grain. By all accounts, the literary and artistic crucible of New York’s avant-garde salons in the 1920s composed a striking mix of personalities and sensibilities, and Ridge quickly assumed a prominent if often circumspect position in that world. In February 1922, she became the American editor of Broom. Edited from Rome by expatriate New Yorker Harold Loeb, Broom sought to be the foremost journal of its day— indeed, the journal of cultural note—publishing work by Alfred Kreymborg, Kenneth Burke, Robert McAlmon, Ernest Walsh, Gertrude Stein, Malcolm Cowley, and a host of other writers, a few of whom (like Marianne Moore, William Carlos Williams, and Hart Crane) would eventually enter the canon of American literature. Part of Ridge’s duties as American editor was to host a literary salon on Thursday afternoons with her second husband David Lawson, where the likes of Kay Boyle, John Dos Passos, Mina Loy, Glenway Wescott, Jean Toomer, Edward Arlington Robinson, Marianne Moore, and William Carlos Williams would read their work and discuss artistic and literary trends. “We had arguments over cubism that would fill an afternoon,” William Carlos Williams recounts in his Autobiography.12 For her part, Kay Boyle observes in Being Geniuses Together that Ridge inspired sharply divided responses among those attending the salon. For Boyle, Ridge’s commitment both to the poor and her art brought her near to sainthood. “I cherished and protected her as if she were a small bright flame,” Boyle recounts. “Her work expressed a fiery awareness of social injustice as eloquently as Emanuel Carnevali’s or Maxwell Bodenheim’s, but it was always Lola’s voice that spoke, a woman’s savage voice, not theirs...”13 In contrast, by Boyle’s own admission, Robert McAlmon “had little sympathy for Lola’s earnest commitment to the arts and to the working class, a commitment so dramatized that people felt the necessity of either defending or abusing her whenever her name came up.”14 William Carlos Williams sums up the manner in which Ridge presided over the salon rather tersely and ironically but no doubt perceptively given the intensity of her social, artistic, and spiritual beliefs—“She made a religion of it.”15 Matthew Josephson, a would-be poet and associate of Harold Loeb’s, in his Life Among the Surrealists dismisses her time and again as “difficult” and condescends to her editorial abilities when he recounts that the European editors rejected most of the writers she recommended.16 Loeb objected to her “hair-trigger judgments and dogmatic opinions.”17 To be sure, it appears that Ridge was difficult in the way all passionate artists and social advocates are difficult when their sensibilities clash with those of others, and especially those in power. Ridge often took no salary for her work on Broom, and though Boyle often portrays Ridge haloed by the candle glow of sanctity she also avers to Emanuel Carnevali’s remark that Ridge “suffered with the snarl of a lioness... flinging itself madly against the walls of the ugly city...she is one of the most beautiful signs we have of women’s emancipation.”18 In short, it is probably true that for all their pretenses to modernity, Josephson, McAlmon, and Loeb were afflicted by a very traditional condescension toward the abilities of women—especially a woman like Ridge who, for all her modernity, clearly viewed the modern world of urban blight, poverty, and the progress of capitalist machine culture in a drastically different light. In a famous phrase that has curiously come to define his own personal life more than the modern world he sought to describe, T.S. Eliot observed that our world suffered a “dissociation of sensibility,” a split between intellect and emotion that the modern poet needed to overcome.19 For Eliot, as for his fellow expatriate Ezra Pound, the modern world was a shambles. For Pound, this meant that the strong hand of Fascism became a necessary evil in order to restore an imagined golden age of Art and Culture to be appreciated, like all true art, only by the few. For Eliot, in addition to his political and cultural conservatism, it meant embracing an insular version of faith verging on quietism and requiring the renunciation of “strange gods,” including the modern world’s inevitable tendency to mix communities and races. At the root of Pound’s aesthetic elitism is the need to make a religion of Art—“O bright Apollo.../What god, man, or hero/Shall I place a tin wreath upon!”20 Read in the light of Pound’s embrace of Mussolini, these lines from “Hugh Selwyn Mauberly” are prescient in their irony in more ways than the poet first intended. For all his learned recoveries and translations from Homeric Greece, to Troubadour Provence, to T’ang China, Pound’s foraging of the cultural past betrays his desire for aesthetic “purity control,” an impulse that could not be further from the cultural mélange of the Lower East Side. Eliot’s genius also recoils from modernity, and eventually embraces an ideal of ascetic purity. In contrast, Ridge’s asceticism points her outward toward the defining “otherness” of her world—the teeming immigrant “ghetto,” which is nothing if not an incipient figure for the world we have come to inhabit in the twenty-first century. Loeb found Ridge maddeningly absolutist in her judgments, though Loeb’s seemingly objective account of the rift demonstrates an equally obdurate position. Capitalism is regarded as an impersonal cultural force, not to be judged on its effects on people. The products of capitalism, to use a capital metaphor, are Loeb’s only concern. Indeed, he invests them with an “impersonality” as doctrinal as Eliot’s claim in “Tradition and the Individual Talent” that all great poetry must be impersonal.23 Moreover, at the same time as religion is deemed “untenable,” and valuable only for its “glorious artifacts,” capitalism becomes invested with a spiritual validity of the highest magnitude. Loeb, of course, is recounting a time when many expatriates like himself could absorb the wealth of European life and culture by appealing to the divine economies of their trust funds. That would change after 1929, and the underside of capitalism that Ridge knew and sought to portray became more widely experienced. In any case, it becomes clear from such recollections that Ridge not only distrusted capitalist modernity as vigorously as Eliot and Pound, she also fought to overcome a profound dissociation of sensibility by seeking to fuse together in her own work and the work she championed the incompatible forces of her religious and spiritual idealism with the social and materialist imperatives of her leftist convictions. 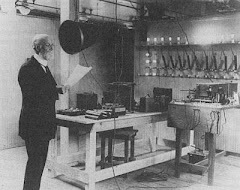 That fusion, had it been successfully achieved, might have given high modernist poetry another alternative to the futurist secularism of Williams and the cultured pessimism of Pound and Eliot. Instead, Ridge’s inability to adequately achieve that synthesis is itself instructive of the internal quarrel that shaped her work as well as the pressures and pitfalls she failed to negotiate in trying to attain the kind of indispensability reached by other poets of her time. Will you feast with me, American people? But what have I that shall seem good to you! Though the poem begins with an invitation, Ridge’s conceit of a shared feast quickly devolves into a Blakean plate of oxymorons—bitter apples, honeyed thorns. At first the poem appears emblematic, almost allegorical, but in fact her ironic choice of metaphor instructs the reader to call to mind the brutal world of hunger and poverty that is the other America of breadlines and oppressed workers. With this deft inversion of the reader’s expectations, Ridge transforms a song of American innocence into a song of American experience. It is, to use her own words in describing Whitman’s poetic revolution, “a grand nihilistic gesture.”25 Just as she envisioned Whitman’s poetry assailing “the whole bastille of form and thought” so she frames her own work as an effort to demolish mannerism—what she called in a review of one Georgian anthology the poetry of “a tactful hostess picking her dinner guests.”26 Instead, she would in the manner of her friend and exemplar, Alfred Kreymborg, “deal direct with life,” to get out and make a clearing “instead of huddling in mental tenements.”27 Here is Blake’s metaphor of “mind-forged manacles” updated to the twentieth century, evocative of a world akin to the stultifying cocktail parties from which Prufrock sought escape. The march of their enduring flesh? Clearly the capitalist spur for profit drives Ridge’s trader, though still—contrary to her own political lights—she manages to portray him in the fullness of his humanity. There are no Jews “squatting on the window sill” as we find in “Gerontion.” There is, in contrast, a profound awareness of the poet’s eye seeking to encounter the other through what Emanuel Levinas would call “an epiphany of the face.” In such an epiphany “I and other” are illuminated in a mutually sustaining relationship. Out of the bloody stills of the world . . . In contrast, Objectivism, the indigenous movement in twentieth-century American poetry defined by William Carlos Williams, and later by Charles Olson and George Oppen, eschews any direct appeal to the spiritual in its aesthetic formulation. Objectivism grew, in part at least, out of imagism. Ridge read Pound and Amy Lowell (who became the preeminent practitioner of imagism in the United States). As many of her poems demonstrate, Ridge found imagism a sympathetic technique. She uses it often to create her atmospheric effects in “The Ghetto.” More than imagism, objectivism celebrates the materials, the object itself. The most obvious example of the practice is Williams’ “The Red Wheelbarrow”—the celebrated “no ideas but in things.” At first glance it would seem Ridge’s communism would be more sympathetic to the objectivist method, shaped as it is by the materialist refusal of the religious ideal. (Feet running before the sleuth-light. . .
Far from being sentimental and retrograde, at its best Ridge’s poetry unites what Robert Lowell (alluding to Levi-Straus) would later observe as twentieth-century poetry’s tendency to divide itself between “the raw” and “the cooked.” The subjects in “Sons of Belial,” “The Ghetto” and “Lullaby” (with its living child thrown to the flames by a white woman during a race riot) are as raw as any American poets’ in this century. At the same time, her gift for metaphor as well as her tendency to intersperse elevated diction into a poem—the ironic and perversely fanciful “rigadoons” follow “the smell of burnt flesh” in the example above—demonstrates that she can “cook” a poem quite elaborately. One can see how, in reading these lines, Josephson might make his terse conclusion. They aspire to a high Romanticism worthy of Shelley and, indeed, Ridge won the Shelley Memorial Award in 1935 and 1936. On the other hand, there are passages in Crane shaped to an Elizabethan density that are no less grand in their Romantic musings than Ridge’s. The real intent behind such soaring passages in “The Ghetto” is to accommodate a language of biblical and not just Romantic intensity to the circumstances of twentieth-century urban deprivation. Given the subject of the poem, it does not seem a grandiose ambition. For Ridge, as for Weil after her, in a world geared toward the fulfillment of abundant life for all, both work and art ought to be spiritual disciplines no less than work and prayer. The difference is that for both of these extraordinary women, as for Day, their St. Benedict’s contemplative cell had to be furnished among the tenements and the factories. It is this quest for abundant life, found amidst the welter of life and not in the poet’s solitary room nor in the hermit’s cell, to which Ridge committed herself in her art. The difference in tone between the two poems is extraordinary, though like “The Song of Iron,” “Reveille” is also a poem intended to be a call to the workers of the world to rise up in the name of justice against their oppressors, but it accomplishes that intention with a simplicity and immediacy that is enviable. Put simply, regardless of whether one agrees with Ridge’s politics, “Reveille” is an infinitely better poem because the poet has beaten back the temptation to assume the mantle of the transfiguring prophet. Despite her passionate convictions, or perhaps because of them, Ridge gradually substitutes the hyperbole of political and religious rhetoric for the genuine quarrel with self by which a poet advances both in the craft of making and in the achievement of a sensibility that continually tests itself against its own convictions. In failing to resist this temptation, Ridge’s penchant for “interpretation” leads to an equally strident indulgence in figuralism that Crane warned might transform itself into barren aestheticism. That being said, her strongest work from across the span of her career has not received adequate serious attention for its contributions and historical significance. In describing Ridge’s later work, Quartermain remarks that her poems “drift toward the abstract and symbolic and toward the mystical and spiritual,” though the mystical and spiritual are not new elements in her work but rather constitutive of her imaginative proclivities from the outset.59 The heavy-handed symbolism and abstraction of her last three books (Red Flag, Firehead, and Dance of Fire) emerges out of a spiritual urgency present in the best poems of The Ghetto and Sun-Up, as well as those instances of authentic achievement found in those three later books. At such times, Ridge’s spiritual and mystical impulses find embodiment in the materials, in the hard edge of experience. In Sun-Up, poems like “Jaguar,” “Wall Street at Night,” and “East River” muster something of the arresting energy found in Rainer Maria Rilke’s Ding Gedichte, though in the imagist mode. “Sons of Belial” and “Reveille” are likewise poems that refuse to sacrifice Ridge’s vivid realism to pretensions of social and religious prophecy. The long title sequence “Sun-Up,” with its child’s voice and swift juxtapositions, anticipates Theodore Roethke’s “The Lost Son” in the same way that “The Ghetto” anticipates Galway Kinnell’s “The Avenue Bearing the Initial of Christ Into the New World.” Moreover, throughout these two books Ridge’s poems mark an advance on the portrayal of the voices of women in the poetry of the twentieth century. As such she anticipates the explosion of women’s voices in American poetry during the latter half of that century, and in particular the poetry of Muriel Rukeyser finds precedent in Ridge’s New York of poor immigrants and workers. She is undoubtedly an important if neglected ancestor for contemporary American women poets, and to American poetry more broadly considered with respect to writers like Philip Levine as well as the plethora of immigrant poetries. Likewise, considered from the standpoint of her own time, she is an insufficiently recognized part of the confluence of politics, culture, and the burgeoning of women’s voices at the advent of modernism to the start of World War II. There sounded a tumultuous music. These lines in praise of Jeffers achieve with far greater dexterity, nobility, and power Ridge’s mystical intuition of divinity incarnate in the substances of matter and history— the “dynasty of fire” her later poems sought largely in vain to represent. In describing the limitations of one of her friends and fellow organizers at The Catholic Worker, Day remarked that those limitations were caused by the “absorption in the supernatural rather than the natural, in the unseen rather than the seen.”72 Such are the limitations of Ridge’s later work when she fails to forge her ideal communion between the opposing materialist and spiritualist poles of her sensibility. It is a synthesis that Day was able to achieve in her life, though she by and large gave up her artistic impulse to achieve that synthesis. At the same time, Ridge’s best work, from the beginning to the end of her career, rings consonant with Weil’s undeniable truth: “This world into which we are cast does exist; we are truly flesh and blood; we have been thrown out of eternity; and we are indeed obliged to journey painfully through time, minute by and minute out.”73 It was the journey of Lola Ridge’s life and work to offer just such a testimony, and her poetic achievement as well as her political commitment may be measured in large part by both her passion and persistence in staying the course. 1900–1940 (New York: Gordian Press, 1969), 444. 8. Ridge, Lola, Red Flag (New York: The Viking Press, 1927), 73. 9. Pearse, Padraic, Plays, Stories, Poems (Dublin: Talbot Press, 1966), 340. 10. Boyle & McAlmon, Being Geniuses Together, 16–17. (New York: New Directions, 1951), 135. 13. Boyle & McAlmon, Being Geniuses Together, 15. 15. Williams, William Carlos, 135. 17. Loeb, Harold, The Way It Was (New York: Criterion, 1959), 103. 18. Boyle & McAlmon, Being Geniuses Together, 140. 20. Pound, Ezra, Selected Poems (New York: New Directions, 1957), 63. 21. Josephson, Life Among the Surrealists, 246. 22. Loeb, The Way It Was, 123. 23. Eliot, Selected Essays, 41. 24. Ridge, The Ghetto and Other Poems, iii. 27. Ridge, “Kreymborg’s Marionettes,” Dial: 29, 31. 28. Ridge, Lola, “Salt Water,” New Masses 3 (September 1927): 27. 29. Ridge, The Ghetto and Other Poems, 3. Brace and World, 1971), 39. 33. Ridge, The Ghetto and Other Poems, 14. 41. Josephson, Life Among the Surrealists, 231. 42. Loeb, The Way It Was, 122. 43. Josephson, Life Among the Surrealists, 246. 45. Ridge, The Ghetto and Other Poems, 33–34. 49. Ridge, The Ghetto and Other Poems, 22–23. York: David McKay, 1977), 60. 54. Ridge, The Ghetto and Other Poems, 61. Crane (New York: Doubleday, 1966), 202. 56. Ridge, The Ghetto and Other Poems, 56. 58. Ridge, Sun-Up and Other Poems, 87. 59. Quartermain, “Lola Ridge” in The Dictionary of Literary Biography, 359. 60. Ridge, Red Flag, 18. 61. Gregory & Zaturenska, A History of American Poetry, 1900–1940, 445. 62. Quatermain, “Lola Ridge” in The Dictionary of Literary Biography, 359. 63. Day, The Long Loneliness, 147. 64. Ridge, Lola, Firehead (New York: Payson and Clarke, 1929), 25, 20, 17. 65. Quartermain, “Lola Ridge” in The Dictionary of Literary Biography, 359. 72. Day, The Long Loneliness, 120. 73. Weil, The Simone Weil Reader, 69.